I’m gathered in a group of people. I’m not sure why I’m in this group. There were a lot of us together, and someone came in and put the guy standing right next to me in the other group. Clearly something important is happening here. I must have been chosen for something, but what? I’m not sure what I did to deserve to be here. As people are sorted into the two groups I start to understand, a little. I can see why she is here. I understand why he is over there. But me? It doesn’t make any sense. Now the answer comes. The one doing the sorting stands above us all and says, “You are in your group because of how you treated me.” This makes even less sense. I’ve never seen that man before in my life. I take that back. I’ve seen him – from a distance. I’ve heard of him. I’ve heard people talk about him. . I’ve read about him. I know he’s important, but I’ve never met the man. Rest assured, I would have known it if I had met him. He’s not the kind of guy you can forget. And if I had been with him, I’m sure I would have treated him with the respect he deserves. I’m in my group because of the way I treated him? I still don’t understand what’s going on. “When you were with the least of my children, you were with me. What you did to them, you did to me,” he says. And suddenly it becomes clear. All this time I had been in a fog I didn’t see. It was like I was standing in front of a mirror in a bathroom after a long shower. Now, with those words, the mirror has been wiped clean. I can see. She was Christ. He was Christ. They all were Christ. And now those times that I interacted with them, the times I saw them and the way I responded came rushing back to me. They played before my eyes like scenes from a movie. And suddenly it is so clear. I know exactly why I am in this group. The prophet George Carlin once said, “Have you ever noticed that everyone driving slower than you is an idiot, and everyone driving faster than you is a maniac?” This, I believe is why everyone, to some extant, is a backseat driver. We’ve all been riding with someone who is either a maniac or an idiot. It can be hard to suppress those feelings when you are quite sure you will either be dreadfully late or die ina fiery wreck. Have you ever driven with a backseat driver? I’m not naming any names, but I may have experienced it from time to time. It can be infuriating to listen to the unwanted advice. “Are you going to turn?” “You’re in the wrong lane.” I think in our heart of hearts, we’re all backseat drivers. Some of us are just more expressive about it than others. As a driver though, have you ever had enough and just said, “Do you want to drive? Do you want me to pull over so we can switch and you can take over?” Have you ever actually done it? 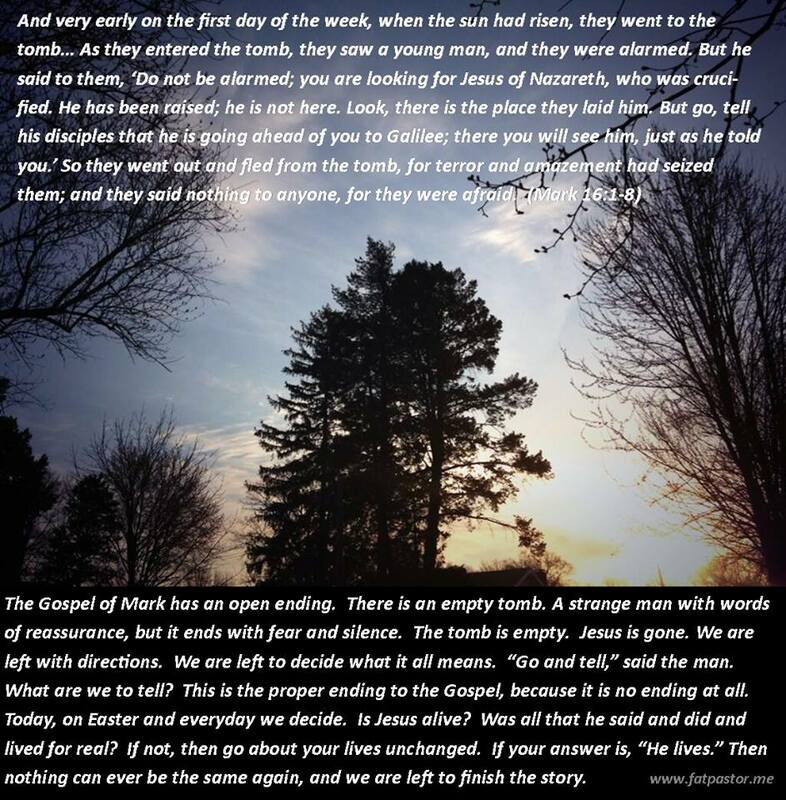 This is the story that is known by many Christians as The Ascension. It is the end of the Easter season, but not yet Pentecost. It is the hinge upon which the writer of Luke and Acts connects those two works. The Gospel of Luke ends with Jesus being taken up to heaven and the disciples worshiping, and then going to Jerusalem. Acts, which is the sequel, picks up with a quick intro, a “Previously on…” and then tells the story of Jesus’ ascension with a little more detail. Jesus, in his last act on the earth, tells the disciples that they will soon be baptized with the Holy Spirit. They ask, “Lord, are you going to restore the kingdom to Israel now?” Read: “Are we there yet?” They figure this must be it. They’ve been with this guy for so long, surely this is finally the time. Instead, Jesus tells them, “It isn’t for you to know the times or seasons that the Father has set by his own authority. Rather, you will receive power when the Holy Spirit has come upon you, and you will be my witnesses to Jerusalem, in all Judea and Samaria, and to the end of the earth.” Then he leaves. This body, which had already defied the laws of physics by appearing in locked rooms and disappearing at dinner tables, is ‘lifted up.’ Jesus is gone. He actually does it. He gets out of the car and says, “You drive.” So we took over, and just think of all the places we’ve gone. We’ve taken it through building empires, inquisitions and crusades. We’ve taken it through the suppression of science, the trial of Galileo. We’ve taken it to grand cathedrals built on the backs of the poor to prop up the powerful. We’ve taken it to explain plagues and keep people in the dust and shame in the shadow of an angry god. We’ve taken it to the subjugation of women and used it to justify untold abuses and violence. We’ve taken it to manifest destiny, claiming God as the motivation of the genocide of a people. We’ve taken it to enslave a people based on their race. We’ve taken it to Holocausts and concentration camps. We’ve taken it to marginalize the LGBT population. Jesus left and left us in charge and we used the power to subjugate those who look wrong, act wrong, pray wrong, love wrong, and were born wrong. We keep getting off course. How many times have we lost our way? The thing is, Jesus gave us directions. He told us the way. The problem is, the directions seemed a little vague. Go to Jerusalem, then Judea, then Samaria, then the ends of the earth. Now, I can’t help but think that Jesus really screwed up with this one. I mean, I’ve threatened to get out before, but I’ve never done it. I’ve never once let my kids actually take the wheel because I know that things wouldn’t go well. And if I did get out of the car and let the kids drive, would anyone blame them for driving off the road and crashing into a tree? No. I would be blamed. And what kind of directions are those? Is there any wonder we’ve veered off course from time to time? So we stop and lament and cry out to God. We shake our fist at the sky and say, “Why?” and we wonder why we aren’t there yet. Then the angel of the Lord appears and asks, “Why are you looking at the sky?” The answer is not in looking to the sky. As much as I’d like it to be, the answer is not above in the clouds. The answer is not going to come down. The answer is not in the right orthodoxy or the right prayers or the right creeds. As much as I wish Jesus had stuck around for a little while longer, maybe it is time to stop waiting for Jesus to come, and start acting as if Jesus is already in our midst. Instead of looking up, waiting for Jesus to give us the simple answer, we need to be reminded of the directions he actually gave us, and start looking out. Jesus gave us the power, and Jesus gave us directions. “Go and testify to me to Jerusalem, Judea, Samaria, and the world.” Start in this city, then out into the countryside, then into enemy territory, then to all the world. Testify to the love of Jesus Christ. Testify to the way that Jesus lived. Testify to the hearts that were changed, the hungry that were fed, the unwelcome that were invited. Testify to the love that was willing to go even to the cross. Testify to the faith that sent two women to look for him at the tomb, and only to be asked, “Why do you look for the living among the dead?” Testify to the love that conquered the grave. Testify to the love that stands among you, scarred from the nails but still willing to reach out and embrace those who had abandoned and denied him. Testify to the love that knows not manipulation or coercion. Testify to the love that is not of armies and force and restoring kings and sitting upon thrones. Testify to the love that is the Kingdom of God, the love that says that all are welcome, all are free, all are filled, and all are loved. Go to the ends of the earth to testify to Christ’s love, but start with your own heart. Start in your own cities, in your circles. Testify to Christ’s love to strangers and even enemies. Go to the ends of the earth, and stop looking up. Stop looking for the living among the dead. Instead look out. Look out to your neighbor. Look out to the one who is despised. Look out to the sick and the poor and the hungry. Look out and find Jesus not in the clouds, but among the least of these, his brothers and sisters. We won’t find the answers as long as we keep looking up. Look out and be inspired by those that are following. Look around you and see the others that have figured out the way, who know the truth that we won’t find Jesus in cemeteries or the sky. We’ll find him on the journey. We’ll find him when we follow his directions. The difference between seeing and sight. Neurologist Oliver Sacks tells a fascinating story about Virgil, a man who received sight at age 50 after spending 45 years totally blind. His book An Anthropologist on Mars tells a tragic tale about a man who struggled to adapt to his new-found sense. On the surface, it seems like such a story would be a wonderful, heartwarming story of triumph and celebration. In reality, Virgil’s story is fraught with confusion, loss of identity, and even health. At first marveling at the light that he was able to perceive, Virgil was quickly overwhelmed by the confusion of so much light, color, shapes, and movement. What people born with vision take for granted became difficult, even terrifying. A bird flying by, even at a distance (for distance was meaningless to him), was more than a little startling. Making connections between flat shapes and 3D objects was almost impossible (a circle and a sphere were totally unrelated). The story of Virgil is heartbreaking. His tactile world, that was ordered and in which he was thriving, was shattered. His identity was lost as he realized he was neither blind nor sighted. After making some improvements, he suffered a setback when an unrelated illness caused him to nearly lose the ability to breathe. He almost died, and in the process he lost his job, his home, and eventually his sight again. It is one thing to have physical ability to perceive light hitting your retina. It is another process to interpret that light in the midst of the world. Virgil was never able to fully incorporate the light which was in front of him. He was never able to distinguish the shapes, colors, movements, and flashes into a coherent vision of the world. He spent fifty years in world of touch. He was able to spend a few months in a world of vision, and when the two worlds collided, the result was not pretty. It almost indirectly cost him his life. Would he have been able to adapt if given more time? Perhaps. Was the stress of the two worlds colliding too much for him to take? Did it hasten the progress of his sickness? That certainly seems reasonable. 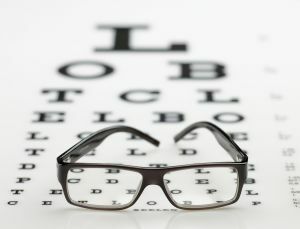 Virgil’s story illustrates that being able to see is different from having sight. There is a story in the Bible about sight and blindness. It is told in the ninth chapter of John. In this story the man born blind has no such difficulty adapting. Instead, it is the Pharisees who cannot cope. They had a very ordered world. It was their role in society to keep the order. They used the Biblical Law to understand what was clean and unclean, what was righteous and sinful, what was in order and what was out of order. A man born blind was clearly out of order. Sin is punished with curse. Righteousness is rewarded with prosperity. After the healing, there is much confusion. The people do not know what to make of this healing, so they take him to the ones whose job it is to answer questions about order. The Pharisees are baffled. They are split. They investigate. In the end, they cannot understand this new order that Jesus is proposing. Jesus does not fit into their order. He healed, which must be of God. He worked on the Sabbath, which is a sin. These two facts are so starkly in contrast, they cannot make sense of them. The world of Jesus collides with their world, and the result is not pretty. When you read Virgil’s story, it is easy to feel compassion for him. In receiving sight, he was changed so drastically that it was difficult to cope. It wasn’t just laziness, or stubbornness. There were physical, emotional, and neurological hurdles that were enormous. That he didn’t “make it” as a sighted person does not make him weak. Perhaps we can take a similar amount of compassion to the Pharisees. Their world was being turned upside down. They knew what they were seeing, but they couldn’t interpret it in the midst of their world. They were not able to incorporate the light which was in front of them. They were able to see, but they never possessed the sight needed to understand what they were seeing. It is easy to condemn the Pharisees, put black hats on them, and call them the bad guys. Demonizing is tricky business. Were they at fault? Sure. It would be wise to remember though, that Jesus cast out the demons, he didn’t cast “demonhood” on others. Neither should we. I think we’d do well to remember that there’s a difference between seeing Jesus, and having vision. When Jesus comes off of the page, out of the two-dimensional world we so often like to keep him, disruptive things can happen. When we incorporate Jesus into the world, there can be collision that is discomforting. Catching a vision of the Kingdom of God knocks us out of our daily existence. It challenges our preconceived notions. It breaks our routine. It shatters prejudices. Suddenly we’re supposed to be loving our neighbor. Suddenly we’re supposed to forgive as we are forgiven. Suddenly all of our instincts of survival and self-hood are replaced by Kingdom instincts of abundant life through selflessness. It’s a struggle, and it’s a process. We may experience a flash of euphoria when the weight of sin and shame is lifted. Usually there is more to it though. It is rare for the scales to be removed, and all understanding to come at once. Even the man in the Biblical story, though he could see, took time to process what had happened to him. Even he didn’t open his eyes and praise Jesus, the Son of God. Jesus healed the blind man so that God’s mighty acts may be displayed in him. There’s a difference between seeing and having sight. We are called to do more than see. We are called to have God vision, to catch the vision of Christ, and see the Kingdom of God. For if we can see it, we can live into it. There is a difference between seeing Jesus in a Bible, or in stained glass, or in a movie, and catching onto this vision for the world. When see Jesus, I mean really see Jesus, it changes the way we look at the world. It changes how we look at our neighbor. It changes how we look at a stranger. It changes how we look at suffering. It should also change the way we see ourselves. See the world with Christ’s vision so that God’s mighty acts may be displayed in you. Upon this verse, much folk theology has been built. The story of the wise men, or magi, or astrologers, coming to visit Mary is an important part of our cultural understanding of Jesus’ birth. One thing needs to be clear, despite the beautiful song set to tune of Greensleeves, they were not kings. There isn’t really a reason to believe there were three of them. There were three different gifts, but no where does it number the men. I don’t bring this up to make any grand theological point other than to remind us of how often we read into Scripture, and how difficult it can be to unpack centuries of tradition. Gold: A gift for royalty, acknowledging that Jesus was of a Royal line. Frankincense: An expensive incense that was burned as a part of worship in The Temple. This signifies Jesus’ divinity. Myrrh: An expensive oil used for perfume. According to this explanation, myrrh was most commonly used among wealthy Jews as an anointing oil for the dead. Thus, the myrrh is seen as a foreshadowing of Jesus’ death and a reminder of his mortality. While this explanation fits nicely into popular modern Christian theology, I’m not sure it really has any historic merit. For instance, how would the strangers from the East have known Jewish ritual customs of the Temple? And it doesn’t say that they worshiped him as a deity. Instead, they “paid him homage.” Also, isn’t every baby mortal? Why would anyone need to be reminded that a king will someday die? According to Cecil Adams of The Straight Dope, at one time Frankincense was the most valuable commodity on earth. It was also used as an eyeliner by Egyptians. Not much symbolic value there. I’ve never been one to go deep into this explanation. I figure it has legs enough without me. This year however, I found another explanation of the gifts. Frankincense and myrrh have been used for medicinal purposes for over 5,000 years in places like India and Saudi Arabia. I do not pretend to know anything about their effectiveness. There are several websites that you can find with articles extolling the virtues of these ancient oils and resins. What you and I think about their effectiveness in healing though, is inconsequential. What seems clear is that men from the East might have understood these two gifts to have medicinal value. Mary gave birth to a son. Though we often sing “Silent Night,” anyone that has been anywhere near the birth of a child knows that there is nothing silent about the experience. Giving birth is a messy and dangerous. Today a mother dies in childbirth once every two minutes. In many parts of the world, it is the most dangerous thing a woman can do. According to the Lukan account, Mary gave birth in a stable, surrounded by animals, with no midwife. She gave birth in what we would be considered, even then, deplorable conditions. I’ve written before that the unnamed miracle of Christmas is that Mary survived. What I have not noticed before this year, is that the reason she survived might have come in the gifts presented to Jesus by the magi. To a modern reader, the gifts of the Magi seem strange and impractical. To explain these peculiar gifts, many have placed dubious symbolic meanings on them. Instead, I feel it much more likely that these gifts were extremely practical. Notice that Matthew says that the magi “Saw the child with Mary his mother, and then knelt down…”. These gifts might have saved Mary, and indirectly Jesus himself. 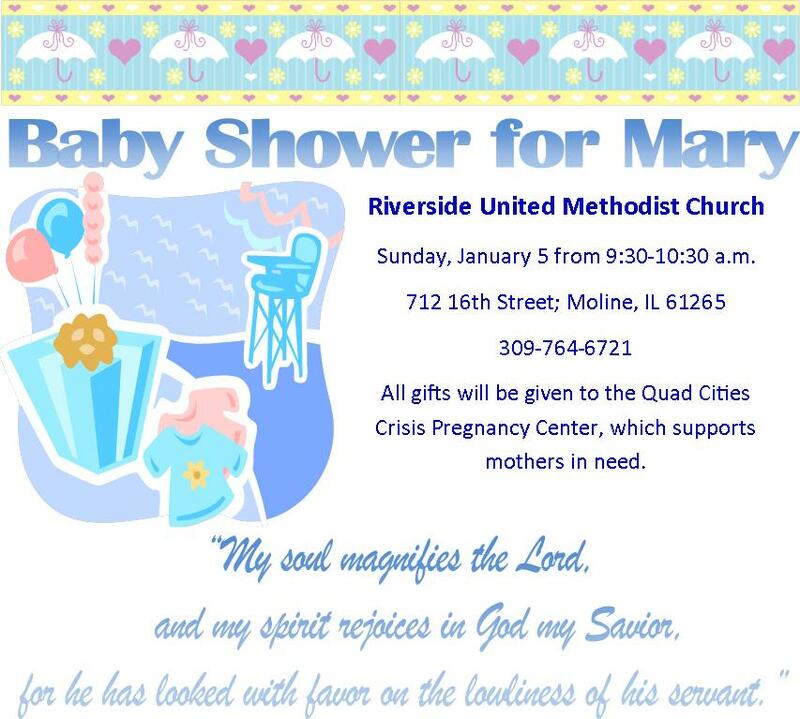 We would be good to take note that Mary’s “Baby Shower” was an act of valuing the life of a woman. Though Mary gets the short end of the stick through much of the book of Matthew, this act of gift-giving is a reminder of how important a mother is to a child. This Epiphany, my church is remembering the gifts of the Magi by having a “Baby Shower for Mary.” The youth of our church are baking cookies, brownies, and muffins. We are putting up cheesy paper decorations, and playing a few silly baby games. All have been invited to bring a gift in honor of Mary. People will bring diapers, onesies, blankets, socks, lotions, shampoos, and more. All of the gifts will be brought to the Crisis Pregnancy Center, which helps women in need. They operate a clothes closet for infants, and are in constant need of the expensive needs of a newborn. This small act of mercy might help a mother care for her child. I’m hoping that in time, we can do more than give gifts to the Center. I’m hoping that we can develop a relationship with them, providing mentors, support, and classes. This is just a first step toward helping children and mothers in our area. Like the Magi so long ago, we may pay homage to the newborn King by making sure his mother survives. There are other things we can do for mothers worldwide. The Healthy Families, Healthy Planet project raises awareness about the need to support international family planning and maternal health initiatives. It is an organization of which I am proud to be a part. This Epiphany, brings gifts to the baby. Save a mother. 1. 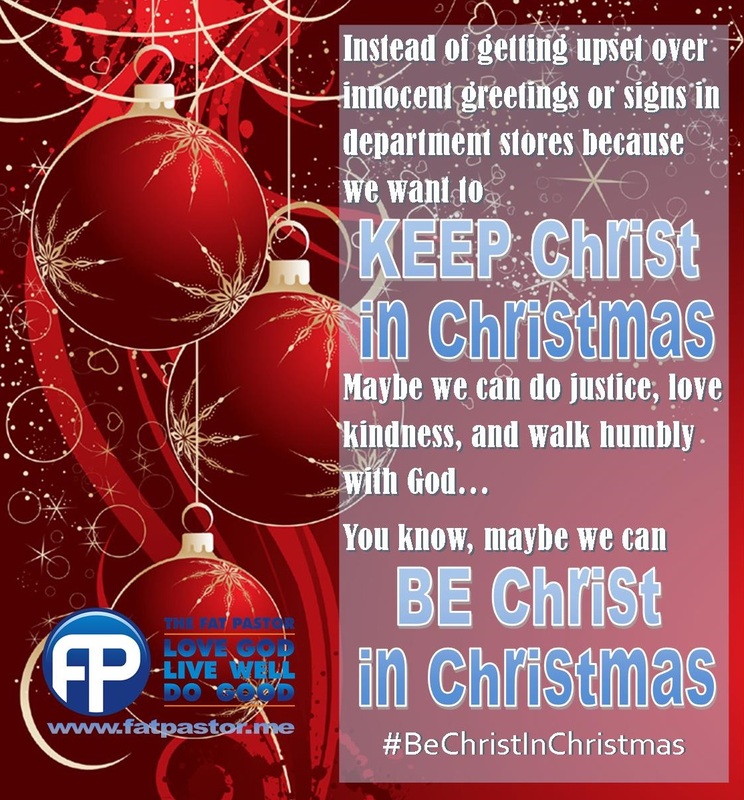 Don’t get mad at people when they wish you “Happy Holidays.” I’m not sure who decided that anger is the right Christian response to a polite greeting from a stranger. I say “Happy Holidays” all the time. Is it because I’m a politically correct, overly emotional, too-sensitive, mamby-pamby, liberal pinko who hates Christmas and wants to hang an Obama Tree in my living room? Maybe, but I’m only a few of those things (I’m not telling which). I just think it is a nice thing to say. People that are looking for Christ at the check-out register of Target might be looking in the wrong place. Frankly, I’m not too interested in finding Christ at my daughter’s public school either. Check that. I can find Christ anywhere, but I find it in the heart of my neighbor, not in slogans, signs, or songs. 2. Go to worship. It might sound overly simple, but maybe we can look for Christ in his house. The purpose of worship is to connect with the divine, so look for Christ in the hearts of your brothers and sisters. Find Christ in the songs of the ages. Find Christ in the passing of the peace, in the breaking of the bread, and in hearing the Scriptures read and proclaimed. If you’re not a church-goer, give it a try. Most churches are at their best in the weeks leading up to and on Christmas Eve. There are few moments of the year I enjoy more than singing “Silent Night,” and lifting a candle on Christmas Eve. I’m not going to guarantee that every House of Worship will suit you. The body of Christ has many flaws and scars, yet the presence of Christ can be found in the midst of this imperfection. Then go out into the world and be the presence of Christ for others. 3. Read the Bible. Again, sounds simple. There are a lot of ways to encounter Christ, and one of them is to read the stories of his life. Read the Christmas stories as found in Matthew and Luke. Read about Jesus’ ministry and discover what he said, who he loved, where he went, and what he did. Allow the Sermon on the Mount to challenge your life. Allow the parables to challenge the way you think of the world. Discover the radical strangeness that is the Kingdom of God. Be like a tree planted by the waters, and delight in the stories of Jesus. Then maybe his birth will mean something more. 4. Volunteer. Give your time to a cause that is meaningful. Use your talents, skills, and passion for something larger than yourself. Love mercy, do justice, and walk humbly with your God. Find a soup kitchen, a food pantry, a clothes closet, or a shelter that needs help. Sign up with the Boys and Girls Club. Offer to teach a class at your church. Volunteer to read to kids at your local elementary school. Then after Christmas is over, keep doing it. 5. Shop fair trade. Buy products you can feel good about. Support economic justice by making sure that the people that created the products you buy are paid a fair wage. There is a shop in downtown Davenport I buy a lot of stuff from called SIS International Shop. Equal Exchange is another great company that I love to support. Ten Thousand Villages is a wider chain with some great merchandise as well. 6. Buy gifts that will improve relationships, not just add to clutter. A few years ago my brother, sister, our spouses, and I decided that we weren’t going to buy each other presents. Instead we gave our parents a night with the grandkids, and the six of us went to dinner and bowling. I don’t get to see them nearly as much as I’d like, so I cherish that night we shared much more than any t-shirt or book that they might have gotten me. Last year my daughter got a big Lego Star Wars set for Christmas. It was great, but the best part of that gift were the hours that we spent together working on it. 7. Make one of these. I could buy a cheap box with terrible chocolate to pop out each day leading up to Christmas, or I could make this. The Advent calendar of children’s books is an amazing idea I’ve seen from a couple of people on Facebook. I hope I take the time to make the latter. I’m afraid I’m going to end up buying the former. 8. Go on a prayer run. This is a term I first heard from a follower on my Facebook page. She told me that while she runs, she prays. She solicits prayer concerns from friends from church, and takes them with her as she goes on a run. Sometimes she listens to the Bible as she runs. I’m hoping she adds the Pulpit Fiction podcast to her playlist too. The point is, she’s improving her physical health while at the same time strengthening her spiritual life. She told me recently that she ran her first 5K. I’m so glad she shared her joy with me on the FB page. Now I share her idea with all of you. You can also participate in the 2014 Advent Run to Bethlehem. The distance from Nazareth to Bethlehem is 103.2 miles. Last year, 23 different people made a total of 67 entries in our Advent Run. There were entries from 14 different states plus London, England. We went a total of 255 miles. Join in the virtual run to see if we can cover that distance as a team between Thanksgiving and Christmas. Here is the link to submit your run. It will open on Thanskgiving Day, 2014. 9. Throw a Baby Shower for Jesus. There is a women’s shelter near you. There is a scared teen mother you know. There is a Children’s Home that is struggling to stretch their budget. Invite people to a Baby Shower for Jesus. Have games, food, and decorations just like a regular baby shower. Invite everyone to bring gifts just like at a regular shower. Then give them all away to someone in need, and remember that Jesus said, “I assure you that when you have done it for one of the least of these brothers and sisters of mine, you have done it for me.” (Matthew 25:40; CEB) And if the idea of throwing yet another party before Christmas is too daunting, then wait until Epiphany (January 6, 2014), the day we remember the coming of the wise men to bring gifts to the baby Jesus. 10. Advocate for Justice. The unnamed miracle of Christmas is that Mary survived. Mary gave birth among animals and filth. There was no professional to help her. She was probably very young. The fact that she survived the birth is a miracle that few name. This Christmas, name that miracle. Tell the stories of the thousands of women who give birth in similar conditions every day. There is a natural connection between the need to advocate for maternal health and family planning and the coming of Christ. I wrote this reflection after I went to Washington to meet in Congressional offices on Capitol Hill. Understand though, that you don’t need to go to Washington. Write or call your local Congressional office. They pay attention to what people talk to them about. 11. Tweet #BeChristInChristmas. Share ways that you are being Christ to someone else this holiday season. Use the power of social media to share the good news of Christians being like Christ. Last year there were a few people that participated and shared some great ideas that included sending cards to soldiers, shopping for an Angel Tree, and singing in nursing homes. I’m hoping that this idea can grow, and we can all be inspired to do something for mercy, justice, and kindness. Be the hands, feet, heart, mind, and mouth of Christ this Christmas. And please, have a very happy holiday! 12 Listen to this song by Christopher Grundy. This is not comprehensive. What are some commandments that you would add? 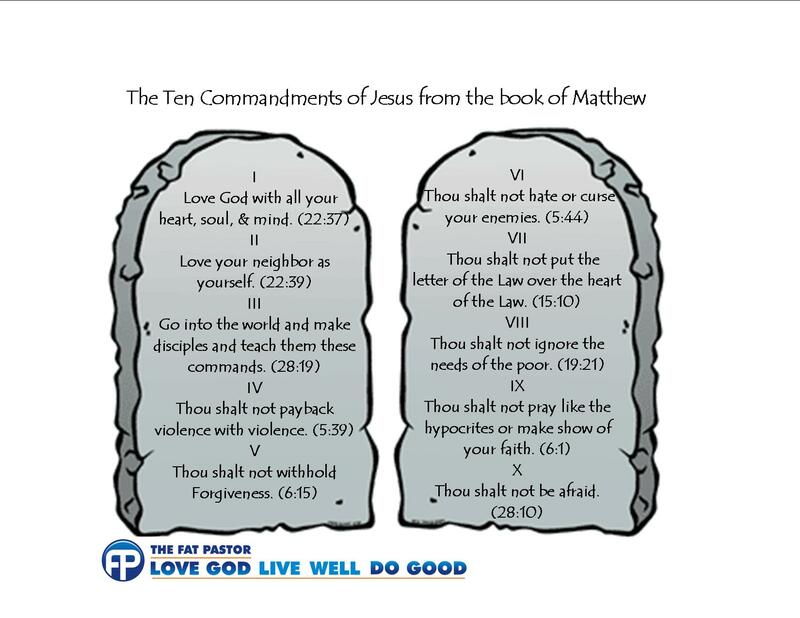 There are a lot of people that clamor to put the Ten Commandments in public places. I believe too firmly in the separation of Church and State to want to see that happen. Yet sometimes I wonder why no one seems to want to put the sermon on the mount in the courthouse lobby? Jesus said, “When they wish to haul you to court and take your shirt, let them have your coat too.” How would that go over? After we put the sermon on the mount at the courthouse, could we put Luke’s sermon on the plain on Wall Street? How would that fit? He said to “lend expecting nothing in return” (Luke 6:35 in the sermon on the plain). What would that do to our economic system? Really, I can’t help but wonder if there is any way to reconcile a realistic society with Jesus’ teaching. Does our justice system of punishment and retribution have anything to do with the grace and peace that Jesus taught? Could our society function on the premise of turning the other cheek? Could our economic structures survive Jesus’ teaching about money? Jesus places some pretty big demands on his followers. It is hard to imagine how it would even work. But then, do the systems we have in place now work? I’m not sure a society can function under the rules Jesus laid out, but I’m also pretty sure no society has really tried. I’ve always liked this as a quote. I’m not sure why the “in the mirror, dimly” image came to me, but I took this picture about a week ago specifically to make this meme. 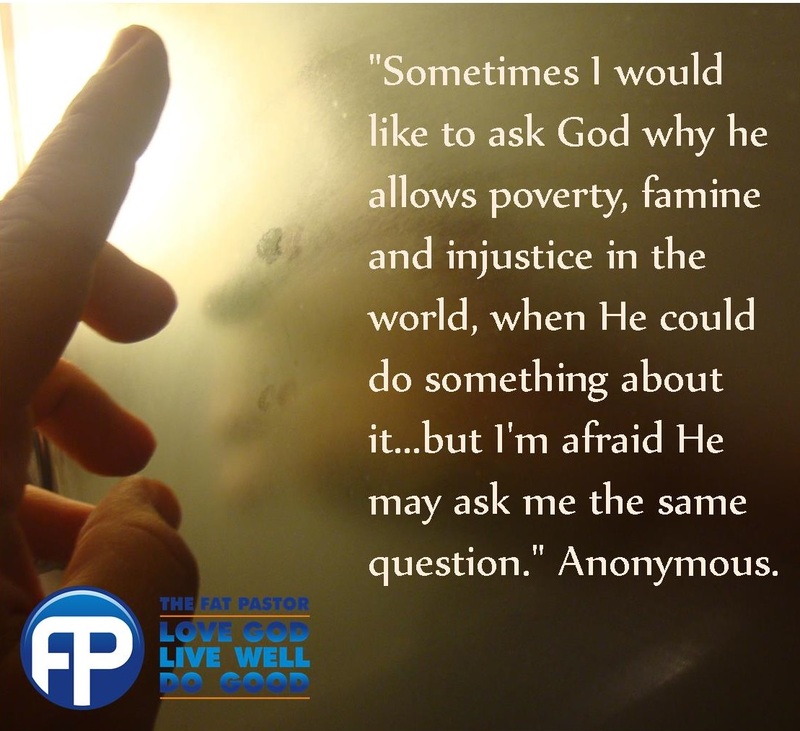 “Sometimes I would like to ask God why he allows poverty, famine and injustice in the world, when He could do something about it…but I’m afraid He may ask me the same question.” Anonymous. It is a lesson I have taught dozens of times. I guess you could say it is one of my “go-to lessons.” In my estimation, it is a pretty important lesson to teach. You were made in the image of God. It is a foundational lesson in the Bible, and the repercussions of understanding it are far-reaching. On the first day with kids at the Mary Brown Center, we started by getting in a circle. Sitting at halfcourt of the gym, there were about 12 kids from the center, and 9 of the youth we brought from Moline. We played an ice-breaker game before I told them a story. “In the beginning was darkness and chaos. There was no order, no light, no substance. Then God spoke, ‘Let there be light.’ And there was light. And God saw that it was good. Then God separated the sky and the world, giving shape to the Earth. And God saw that it was good,” I was encouraged by the attention I had. As I read these words, I was able to look at the children sitting around me. I repeated, “In the image of God, he created them; male and female he created them.” I was a little surprised at just how rapt they were at this point. I didn’t need to call their attention to me. I didn’t have to tell anyone to sit still. So I went on. “Good,” they replied in unison. It is a story I have told so many times. It is always a powerful story to tell, but this time I felt like it was something more. It is easy to tell a group people that they were created in the image of God when everyone in the group looks alike. But we sat in this circle and our differences were obvious. Different races. Different ages. Different social classes. Different home towns. Everything about us was different. Yet at the same time there was nothing different. As we went about the week, we learned more and more just how true this was. We discovered undeniable truths about the people that God has created. We love to create. We love to dance. We love to play. We want to feel safe. We enjoy making friends and connecting to others. The mission of the trip was simple. We wanted to share something that we love with new people. We wanted to share the music, art, and learning that we love with children. In accomplishing our mission, we did so much more. We created friendships. We built connections across all the obvious divides, and called upon something even more obvious, but somehow less well-known. In so doing, we learned perhaps the most important lesson of the creation stories. We were made, above all, for relationship. We were built to be in relationship with God, and with each other. We were created so that we could create. We can create art, music, laughter, friendship. We can create light in the midst of darkness. We can create order in the midst of chaos. We were created in the image of God who is a Creator, and who is still Creating. My prayer is that the relationships we built were built to last, and that none of the kids we met ever forget who and whose they are. I held my daughter. I crawled into her bed, and wrapped her up in may arms. She nestled deeper into me. I smelled her hair and kissed her soft cheek. She took my hand, and pulled it under her head like a pillow. The alarm clock flashed 6:30, but time stood still. I prayed, thanking God for this moment. I paused, And allowed. Myself. To. Stop. Breathe. Deeply. She was safe in my arms, and there was no reason for either of us to ever get up. It would have been so easy to just remain there. She was safe and warm, and as long as I could keep her there in my arms, nothing bad could happen to her. As soon as I whispered into her ear, “It’s time to get ready for school,” I would lose my grip. As long as I held her there she would come to no harm. She couldn’t have an accident. She couldn’t stub her toe, or burn her hand, or get hit by a car. No one could hurt here there. No one would call her stupid or make fun of her shirt. No one could exclude her from a game or break her heart. We lay there together, drifting in and out of sleep, and there was no reason at all for us to rise. Except for one: Babel. The Tower of Babel story is found in the 11th chapter of Genesis. The first 11 chapters are generally recognized as a separate section within Genesis. Walt Brueggemann refers to it as the “Pre-History.” Terrence Fretheim calles Genesis 1:1-11:26 the “Primeval Story.” This section of Genesis includes the two creation stories, the first sin and expulsion from the Garden, the murder of Abel, and Noah and the flood. These are the foundational stories of God and the people God created. It is a myth in the sense that it is a story that explains why things are the way they are. And like all myth, the truth of the story does not lie in the facticity of the events, but rather in the meaning we draw from it about God and God’s created people. Beyond the simplistic questions about historical accuracy, there are deeper theological truths that can be found from this story. There are also troubling questions about the nature of God that rise quickly from the scattered remains of the people. The main question is, “Why did God do that?” It seems like a strange God that is in action here. “There is now one people,” God declares. This kind of unity sounds like a good thing. In a world beset with division, barriers, walls, and wars, a united people sounds like a wonderful place to work toward, not a troubling situation that needs to be fixed. The Tower would be a source of pride and strength. A tower is an important part of any settlement. The Tower draws travelers for trade. Conversely, it helps detect invaders from a distance. It provides a strategic advantage for defense, and serves as an economic hub. The Tower is an important ingredient in protection, safety, and settlement. The people knew that the tower will keep them from being scattered. These things do not, on the surface, appear to be troubling. It is no more troubling than laying in bed in the morning with the one you love more than anything in the world, and deciding to stay there forever. Protection, safety, and settlement are not necessarily vices, but they are not innately virtuous either. A look back at the beginning of the Pre-History reveals to us the problem with the Tower. Look at the first creation story. The work of God was started to create order and life out of chaos and emptiness. This creative work culminates in Genesis 1:27-28, where God not only creates humans, but gives us mission in the world. “God created humanity, in God’s own image, in the divine image God created them, male and female God created them. The sin of Babel was disobedience. Moreover, the people were creating their mission. God gave them a purpose, and they were refusing to act. The languages then, were not given as a punishment. The languages were given to people to help them get the job done. Not the job they intended, but the job God had given them. What has often been seen as a curse is actually God empowering the people to do what they would not do on their own. With this nudge, the Scriptures tell us that the people scattered. They fulfilled their mission, were fruitful and multiplied. I understand the sin of Babel, and I understand the gift as well. I thank God every day for giving me those nudges. Time and again I have thought to myself, “I’m settled.” It seems like every time, God is there, confusing my language, pushing me to a new adventure, a new relationship, or a new mission. Every morning I wake my daughter up to get her ready for school, I build my own little tower. I crawl into bed with her and wrap her in my arms and want so badly to keep her from being scattered. Every time I whisper into her ear, “Honey, it’s time to get ready for school,” I break the tower down. It is one of the hardest things I do. Settlement and safety are not inherently bad things, but anything that works against God’s mission for the world must be worked through. It is so tempting to hold her and never let go. It would be so easy to keep her in my own Tower, but in trying to protect her, I would be hurting only her. God has great plans for her. I’m not sure what they are, but who am I to get in her way? Who am I to ignore God’s calling on her life? She is made to love, to share kindness, to work for justice. She, as she has said, “was born to dance.” No one can dance with their Daddy weighing them down. So I help her to get ready. I send her out in the world equipped as best I can. I kiss her goodbye, go upstairs and wake up her little sister. Maybe I can stay in the tower a little longer with her today.